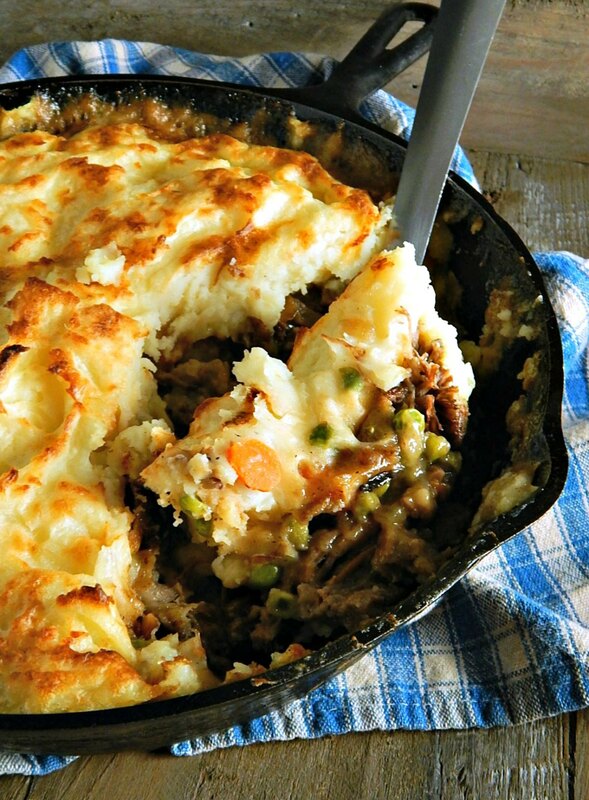 Do you love Shepherd’s Pie? Or Cottage Pie? It’s been a fave of mine since I was a kid. I have a recipe on my site made from ground beef, but the Shepherd’ Pie that will have me running to the kitchen (and the family running to the table) is this one: Shepherds Pie from Leftover Pot Roast. I’ve seen it on tv, so it must be true: Shepherds Pie is made with lamb and Cottage Pie with beef. Whatev, people, this dish will always be Shepherds Pie for me. And this Shepherds Pie from Leftover Pot Roast has gravy which just makes it! Best of all, it doesn’t take much leftover pot roast to make this, only about 2 cups worth of the beef, chunked up. (By the way, if you have leftover stew, using it as the base and topping with these mashed potatoes is a great way to refashion and stretch it.). There’s something about Shepherds Pie that’s so comforting. I think it’s the mashed potatoes. Well, that, and the fact that any Shepherd’s Pie is kind of just down-home comfort food, filling, delish and easy to make. And while most recipes are made from ground beef, like my Shepherds Pie already on my site, this one is made from leftover pot roast (you might have guessed that already, lol!) I made this Shepherd’s Pie from some beef leftover from That Old Lipton Onion Soup Pot Roast, but just about any leftover pot roast will make a stellar Shepherd’s Pie. I do have a few other Pot Roast recipes on my site, too; check my main menu for Beef Meals & Entrees if you’re looking for options. Part of what makes a Shepherd Pie made from leftover pot roast and gravy (and I show you how to make the gravy or more gravy if you need it, in the recipe) is not just how the gravy coats all the beef and veggies, kind of like a pot pie, but how it also bubbles up around the edges of the pan and kind of melds with the bottom portion of the mashed potato topping. It’s just divine! This is one of those want to lick your plate clean kind of meals! My Shepherds Pie from Leftover Pot Roast has a deep, rich, long-braised flavor from the pot roast leftovers – and it’s the kind of meal you probably won’t even guess came from leftovers. But if you have one of those people in your family who won’t eat leftovers, don’t give them any of this. Nope. They just don’t deserve it. Tell them to make a peanut butter sandwich while you dine like a Queen. Or King. Ok, maybe you can’t do that but it’s fun to think about! At least for me…I hate cooking for someone who doesn’t like leftovers. You’re going to start out this recipe with sauteing the veggies. Then when that’s done, you’re going to have to figure out how you’re going to get the gravy. You’ll need about 2 1/2 cups, which isn’t really super particular, but you want it close enough so everything isn’t drowning in gravy or even sadder, too dry. Chances are, even if you do have leftover gravy, you might not have just the right amount. Or maybe you don’t have any gravy? No worries because we’ll make up a quick pan gravy to supplement what you do have or to make your own, right in the skillet you’ve sauteed the veggies in. So put any gravy you’ve got in a measuring cup and figure out how much additional gravy you need to make 2 1/2 cups total for the recipe. Most gravies have a pretty standard ratio of 1 tablespoon of flour to 1 cup of liquid. So just sprinkle the amount of flour you need over the veggies, cook it off a bit so it loses it’s “raw” taste and then add in beef broth. If you need one more cup of gravy, use 1 tablespoon flour and 1 cup of broth. If you need 1 1/2 cups of gravy, use 1 1/2 tablespoons flour and 1 1/2 cups broth and so on. Use the full amount of flour and broth in the recipe if you have no gravy at all. When you saute the veggies, make the gravy, add in the leftover gravy and leftover roast and the peas, the mixture really doesn’t look like much. You might have some doubts about the amount but once the mashed potatoes are on and it’s all baked up you’re going to find it’s all ok. I dunno, it’s maybe a little magical the way Shepherds Pie from Leftover Pot Roast manages to stretch a few leftovers to feed a family. You can never go wrong when you utilize your leftovers in a way that stretches them for another meal, especially if the second round is just as good (or even better) than the first. I always say leftovers are the most expensive food in your house! You’ve paid for the groceries, transported them, stored them, cooked them & then stored them again. That’s a big investment in money, time, energy and your own energy. Anytime you can use a bit of leftover this or that as a shortcut or building block to another recipe, you’re that much further ahead. See my menu for Fabulous Leftovers on the right-hand sidebar or click the link. I’m always adding and updating my leftover possibilities. Larger bags are often a mix of different sizes. I go through the bag and set aside the larger uniform ones for baking and then use the mixed sizes and shapes in recipes like soup, pot roast, mashed potatoes or any recipe where a uniform size doesn’t matter. Store your potatoes in a loosely closed bag away from any onions and in a cool place. It’s not unusual to see them next to my back kitchen door in the fall and winter, but in my small kitchen, I have to be creative! You will want about 2 1/2 cups of gravy to make this recipe. If you have enough leftover, great. If not, figure out how much leftover gravy you have and make the quick gravy in the recipe to make up the difference. Use a tablespoon of flour for every cup of broth. Example: you have one cup of gravy, you’ll want 2 1/2 cups total. Make 1 1/2 cups of gravy using 1 1/2 tablespoons of flour and 1 1/2 tablespoons broth. Start the potatoes to boil (see note below) and then continue with the rest of the recipe. In the pan the potatoes were cooked in, while potatoes are still hot, mash the potatoes. Add 2 tablespoons butter and the milk and continue to mash. Add salt and pepper. The mash should be stiff and heavy but a texture that’s spreadable. Add a little more milk if needed. Cover to keep warm while the rest of the dish is assembled. In a 10-inch ovenproof skillet, heat the three tablespoons butter over medium heat. Add the onions, celery, and carrots, and stir. Continue to cook, stirring often, until softened, about 8 to 10 minutes. Sprinkle with the amount of flour needed to make the amount of gravy you need. Stir for about 2 minutes until flour begins to appear dry and incorporated. Add the amount of broth you need and stir, bring to a simmer and cook several minutes until thick enough to coat the back of a spoon. Add any additional leftover gravy and heat through. Taste and add Worcestershire sauce, a splash of wine, salt, and pepper to taste. Gently stir in leftover pot roast, sprinkle with peas, top with mashed potatoes. Make the top attractive with swirls or with a crosshatch done with a fork. Brush with the melted butter and place in oven to heat through, about 20 minutes. It’s ready when hot; the gravy will probably be bubbling up around the edges of the pan. If the top isn’t browned to your satisfaction, turn on broiler and watch carefully. It usually takes three or four minutes. To cook potatoes: Peel the potatoes and cut into 1/2-inch dice. Place in a medium saucepan and cover with cold water. Set over high heat, cover and bring to a boil. Once boiling, uncover, decrease the heat to maintain a simmer and cook until tender and easily crushed about 10 to 15 minutes. Drain and return to the pot to keep warm. If you don’t have an ovenproof skillet, the ingredients for the Shepherd’s pie can be transferred, after cooking, to a casserole and then topped with the potatoes. I’ll be sharing my Shepherds Pie from Leftover Pot Roast at Fiesta Friday #243, hosted this week by Catherine @ Kunstkitchen’s Blog and Becky @ Bubbly Bee. I’ll also be sharing at the Lazy Gastronome. Helen posts a weekly link up, What’s for Dinner? This entry was posted in Click here for Fabulous Food Posts and tagged Bargain Meal of the Week, Beef, Carrots, Irish, leftover beef, mashed potatoes, Peas, Potatoes, shepherd's pie. Bookmark the permalink. I would like to know if I can put this together in the morning and then throw it in the oven this afternoon. Hi Ashley – I was a little out of commission yesterday, so sorry to reply so late! Yes, you can put it together ahead – just bake it a little longer (but you maybe already did that? Anyway, I hope it worked out for you!! Yes yes Mollie – I love both cottage and shepherd’s – they were childhood staples for me thanks to the lack of variety in hot dishes that came out of my school kitchen. For a long time I got stuck on Jamie Oliver’s more-ish recipe…..nowadays I’m more likely to experiment with vegetarian versions…great post! I’m going to have to check out Jamie’s recipe. I love that guy! Yes do – he always gets inventive and throw in a couple of ingredients that you wouldn’t expect but that work a treat! That’s the best use for leftover pot roast ever! Btw, I have tentatively put you down to cohost on Oct 19. Is that good or not? It works for me, Angie! After a little thought, why don’t you put me down for, say, the 4th Friday of every month until the New Year if you aren’t filled up? This is the best news I heard all week!! Wow, Mollie, you’re making me excited about the fiesta 😀 Knowing that you’ll be cohosting regularly is very comforting somehow. So, for now I have you on Oct 19, Nov 23, and Dec 28. Is that okay? I made this using left over Pike’s Peak roast I cooked in the slow cooker. Fantastic! Thank you for including the ratio of flour to broth. The gravy was perfect. Thanks for stopping back with the update! I’m so glad you liked it. Gravy can be mystifying to some people, I think, because it’s always included with recipes so each one is kind of specific. Oh my gosh! What time do you want me to come for dinner, lol!! Anytime, but it might be a very long trek. Hi and thanks!! 🙂 There are some meals that I wish for everytime I scroll through my own blog and this is one!! Shepard’s or cottage pie, I’m all in. We love to use our leftover roast meat,poultry and fowl in such a way. Pure comfort. For me, all I need is a plate of the pie and a cold beer and I’m good to go. Mollie, have you ever had fish pie? A similar dish and very popular over this way. I haven’t had fish pie but I recently saw a picture of one not with a mashed potato but with a shingled potato crust. It looked amazing! Being from Iowa, then Colorado and now Minnesota, I wasn’t raised on much fish. In Iowa it was mostly Northern, which people often smoked, in Colorado, trout and here in Minnesota, it’s all about the Walleye which I don’t care for as much. But you almost have to seek fish out here in the Twin Cities. It’s easy to forget that most of the world depends on fish as a mainstay of their diets! Mollie, fish pie is the best place to use frozen fish in my mind. We use frozen salmon or cod most often. But, about any frozen fish of choice would work. Hum, maybe I should do a post on my favorite fish pie.